Baked plantain with a side side serving of a sweet and creamy dip made vegan and paleo friendly courtesy of the cashew nuts. I hope you guys had a wonderful Christmas (those of you who celebrated) and ate plenty of nutritious food. I bet you didn’t, I’m willing to bet some old habits resurfaced over the festive period. Yes, I’m talking to you with that guilty look on your face. All is forgiven if you’re willing to try this Caribbean styled appetiser? Well…..? 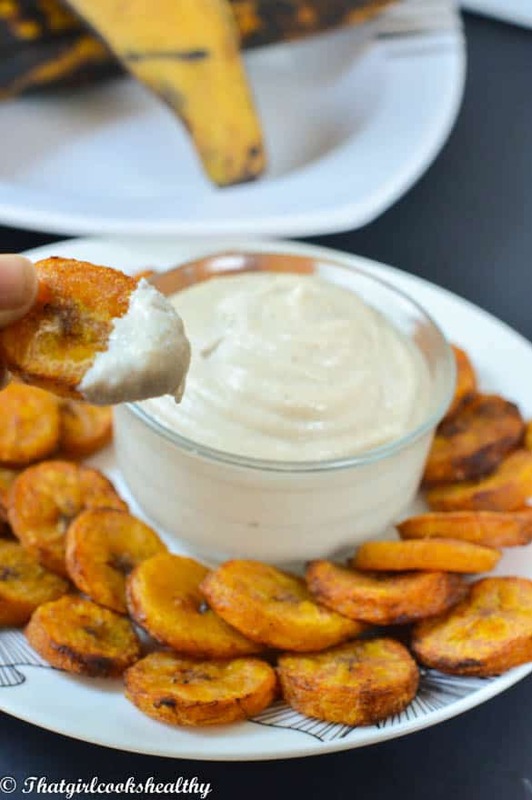 Okay I won’t coerce you, rather I’ll explain why this wonderful baked plantain with a dip should be on your list of things to make – it’s simple and tasty! I won’t beat around the bush with this one. 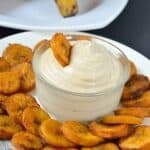 By now I’m sure many foodies are familiar with plantain – a starchy fruit (considered vegetable) that is inedible unless cooked and loved by Caribbean, African and Latin American people. 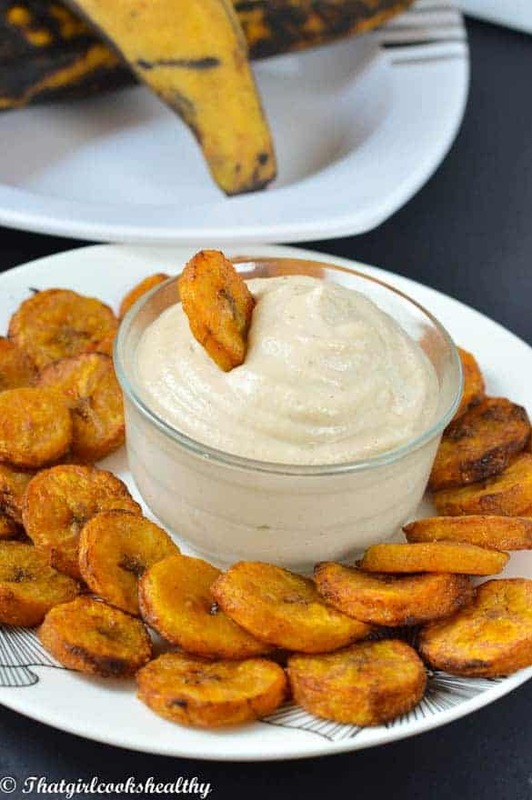 When I made this recipe I thought of a talented food blogger named Imma from Africanbites whose website is centred around African and international cuisines, like me I know she enjoys eating some plantain too. 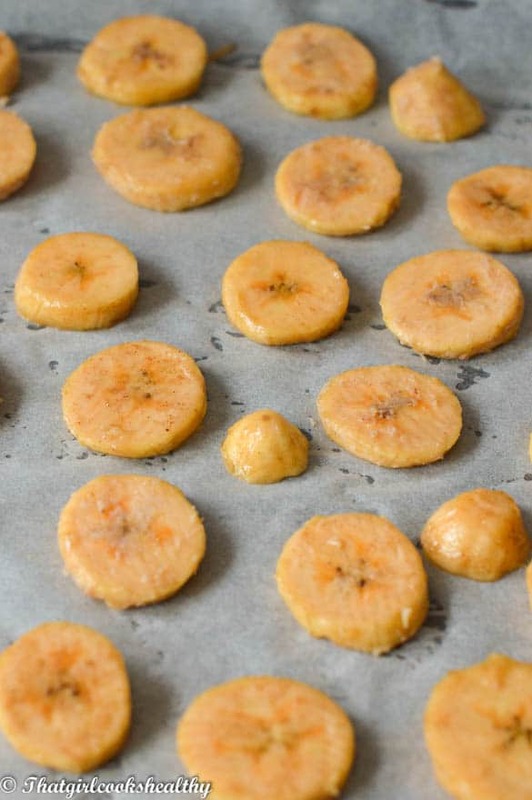 In the Caribbean community you’ll find many of the recipes that feature plantain are either; boiled, steamed or fried. We don’t really roast or bake plantain but I’m a woman who likes to explore and be innovative and that’s exactly what inspired me to make this dish. This appetiser is highly nutritious – loaded with omega fats from the cashews to complex carbohydrates from the plantain. Also, vitamin A to help repair cells and optimise eye sight, potassium – a mineral which is needed to maintain blood sugar, cells and support kidney function. Starchy vegetables are often widely misunderstood. They are often put in the same category as processed starches i.e pasta and bread, little do people know that starchy veggies provide an excellent source of energy. Here, you’ll see I used a plantain with a yellow to dark hue – at this stage the plantain is slightly sweet and firm. As it ripens the colour transitions to a dark yellow almost black in colour. I personally don’t like when they’re over ripe, it’s too sweet and mushy for me. 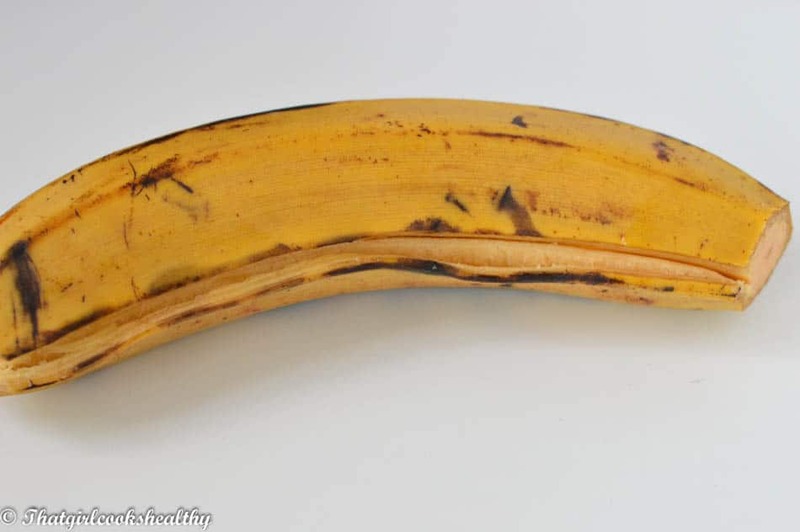 If you want to replicate my results use the plantain at the yellow with dark undertones stage. Cut off the two ends of the plantain and lightly slice horizontally from one end to the other. Now here comes the fun part, slicing the plantain and coating the discs with melted coconut oil, cinnamon and ginger – nice and spicy. Don’t worry if the melted coconut oil begins to harden, it will soften in the oven. Line a baking tray with parchment paper, transfer the discs onto the lined tray and put in the oven. While the plantain bakes in the oven, now is a the perfect opportunity to get the coconut cashew dip underway. A high speed blender is recommended for this part. You can either pre-soak the cashews or add additional water to the mixture for a smooth consistency. 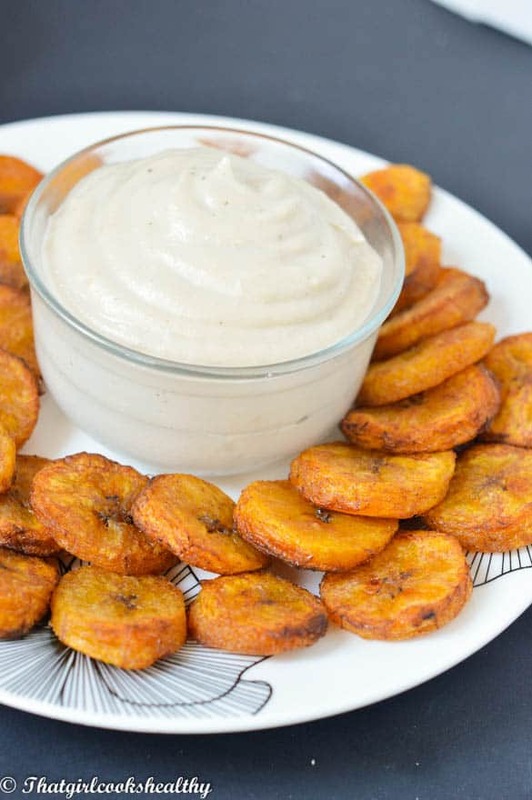 Once the plantain is baked you should be left with crispy, spicy chips with a coconut dip to dunk them in. ** Try to use organic ingredients where possible. Line a baking tray with parchment paper and set aside. Toss the sliced plantain into a large mixing bowl with the melted coconut oil, ginger and cinnamon. Work the oil and spices into the discs and coat them evenly. Transfer the contents onto the parchment paper and place in the oven to bake for 30 minutes. Half way through turnover and continue to bake until both sides are golden brown. To make the coconut dip pour all of the ingredients list above excluding the water into a food processor or high speed blender. Add a small amount of water at a time until the mixture is smooth if using pre-soaked cashews skip the water and go ahead with pureeing. A 1/3 cup should be suffice, if not, add a tbsp at time more until smooth. Plantain and yellow banana are not the same thing. 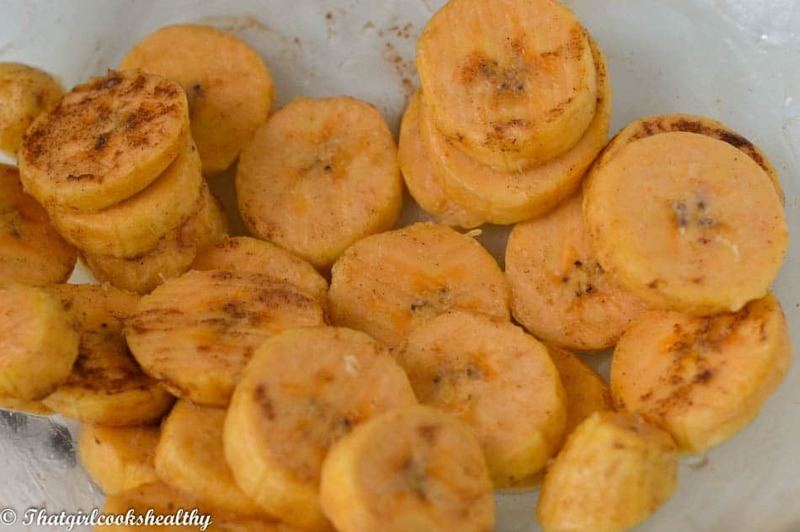 Plantain cannot be eaten raw. Charlene, this baked plantains looks so good. I bet it tastes even better with the coconut cashew dip. YUM! Coconut cashew dip looks delicious and healthy. That’s a must try. Awesome! I love receiving feedback on my recipes especially from moms and dads. I’m so glad that yourself and co enjoyed my recipe. Hi Charlene, i just wanted to say thank you for posting this recipe! I made this over the weekend and it was SO DELICIOUS! I’m on day 26 of my first Whole30 experience and this saved me when i had a sweet craving! My husband loved it as well and i decided the dip was so good that i’d use it like icing for muffins and cakes. So again Thank you!! Hi Larissa. Thank you for commenting. Yes the dip is so tasty isn’t it? I’ve found myself doubling up with it myself.